This is one post in a series dedicated to developing applications for Microsoft Teams. Many of the posts contain code (in GitHub) and manifest files for working samples you can install yourself and play with. Check out the full list of posts on the Developing with Microsoft Teams page. In this post we’ll look at some of the high-level concepts that it’s worth understanding before digging into the code. Whatever type of development you choose to do in Teams you’ll need to become familiar with the concept of an App. An App is essentially the distribution container for your code. It’s how users add your work to their Teams instance. That means that everytime you write some Teams code you need to package it up into an App, using some basic rules. There’s an upside to this as well. In a decent-sized solution that does more than very simplistic tasks, it’s likely that your solution will contain more than one type of development. For instance, you might have a bot which users begin their conversation with, but also a tab to show more information (we’ll cover both of these later). You can wrap all of these different things into a single App, making it easy for users to consume. Apps are also the things you submit to the App Store (duh!) to make them discoverable for others. However, when you’re just starting out, playing around, or making something you want to keep internal then you might not want to submit your app to the App Store just yet. There’s an alternative method of making Apps available for these use cases: sideloading. Sideloading is a process where you can install your App directly, without going through the App Store. Typically used by developers whilst testing out their work you can also use it to install any apps which aren’t yet published to the App Store. However, unless you wrote the App yourself (or you know the person who did) you should treat with suspicion any Apps which aren’t offered through the App Store, which protects you by reviewing every submitted app. So, before you can start developing anything for Teams, you need to be able to put together an App. Let’s look at that now. An App is contained as a zip file. Within that, there are a number of important files which define it. Firstly, there are two image files. These are used within Teams to identify your application. One is 96 pixels square, the other is 20 pixels square. When you’re sideloading apps, you must have both of these icons present. version – this is your version number. name – the name of your application which is shown to users. There is both a short and full name field, because the short field is limited to 30 characters. icons – as previously explained, you need to provide both a 96×96 and 20×20 image for your application. The outline field is for the 20×20 icon, the color field is for the 96×96 icon. accentColor – a hex code value starting with #, which is used by Teams to identify your application and provide some consistency between applications. Notice how none of these fields describe any specific type of development option – they are common to all of them and define general information about your application. They’re required for every application you write. As you start to build different types of Teams applications, you’ll build out this manifest.json file in different ways. In each blog post describing different development types I’ll cover what goes into the manifest, but if you’d like a full reference to have handy so you know all the different configuration options, there’s here on MSDN: https://msdn.microsoft.com/en-us/microsoft-teams/schema. When creating new Teams applications, the manifest requires you to specify a GUID for the application id. 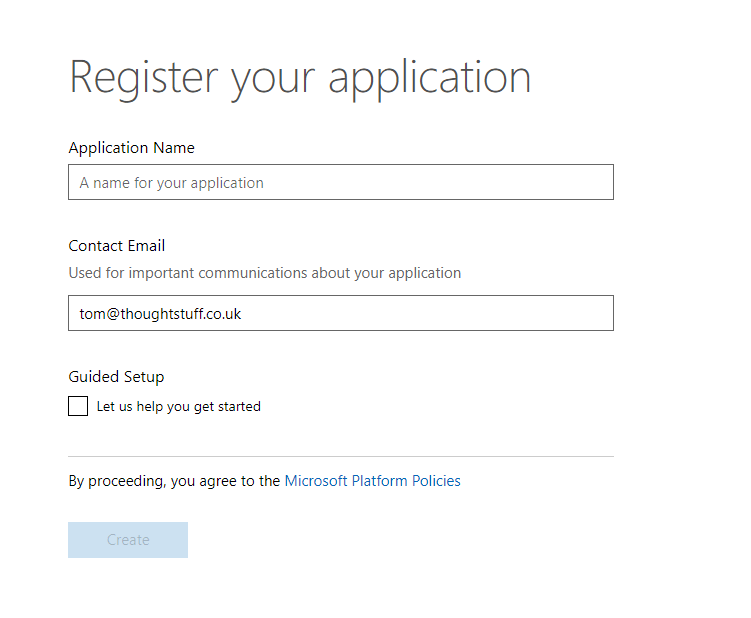 The id should be registered with the Microsoft App Registration Portal. If your application contains a Bot Framework bot then you already have an App ID, created for you when you registered the bot in the Bot Framework Dashboard. Simply copy the App ID from there. Once you’ve filled out all the basic information about your application and anything specific to the type of development you’re including then you’re ready to package. Simply save your manifest.json file in a folder alongside your two images and create a new zip file containing all three files. If everything goes well, then you’ll see your application listed on the screen. At that point, you’re all done and your application is succesfully sideloaded. Now that we’ve covered apps, how to create, package and load them, we’re ready to look at the different types of development options available in Teams. We’ll cover that in the next blog post.